Santa Claus is coming. Tá Daidí na Nollag ag teacht. The season is almost upon us and as with all organised quilters, your projects are probably almost finished, having begun them in July? Not our fault. It was the weather… or something. In Ireland, we can blame the weather for everything. This year, for the most part, we enjoyed an unusually great summer. Obviously when it’s sunny here, it’s criminal to be sitting indoors, never mind working on Christmas projects. Us being in the mouth of Nollaig, was just thinking the other day, that while we have been posting regularly to our Facebook (FB) page, you may not have seen them. [Spotted you screwing up your face and screaming that you hate Facebook!]. No arguments from us, it’s certainly not for everyone, and we’re not about to tell you that you should join. However, just because you don’t ‘do’ FB, isn’t a reason to miss out on some of our postings. So, here are a few links which we have shared to our Facebook page. NB Cregagh Library is in the Greater Belfast area. [Refreshments only apply to the opening on Mon 3rd Dec]. More news from the Athlone Schoolhouse Quilters’. Winner of the Viewers’ Choice award was ‘Shakespeare in the Park’, pieced by Maureen Feary, quilted by Frances Flanagan. As those of us who attended the exhibition can confirm, amongst a great exhibition of quilts, it was indeed stunning. Congratulations Maureen and Frances. We’ll be posting more photos of this exhibition at a later date. This quilt, reflecting the emotional trauma of a tsunami and its consequences was posted originally by the International Quilt Association. It is entitled “Over the Waves” by Setsuko Matsushima of Shiga, Japan. Winner of the Founders Award, sponsored by International Quilt Festival. This came via Dublin Embroiderers’ Association, originally posted by the Embroiderers’ Guild of Victoria. This stunning quilt is the work of quilt artist Deb Hyde (pictured in the photo). Deb creates her pieces using thousands of one inch squares of fabric, painstakingly placed, stitched together and finally quilted. Hundreds of hours goes into the creation of each quilt. She takes her inspiration from photographs or her own life-drawing sketches. Here are some of the videos we’ve shared. Click above for the written instructions. Athlone Sew In – and before you ask, yes, we all had a great time. More about that in our next blog, with photos; suffice to say that on the Sunday morning Neesa McMahon, from Schoolhouse Quilters, gave us a demonstration and individual instructions on how to make these gorgeous little ornaments. Yes, you can view the video, which is excellent, but nothing beats a patient instructor. Neesa was indeed patient and literally held all our hands as we all needed a wee bit of help. Huge thanks to Neesa. “An American Quilter was visiting her son and daughter-in-law this week, and they were talking about gigabytes and terabytes. She told them she had no idea what they were talking about. Auntie C has given us quite a few of these links, which are freely available on YouTube. Thanks to her for this and the following pincushion ornament. There’s no shortage of adorable ornaments to make before we get caught up in the madness that is Christmas! Congratulations if you have read all the way to the end. 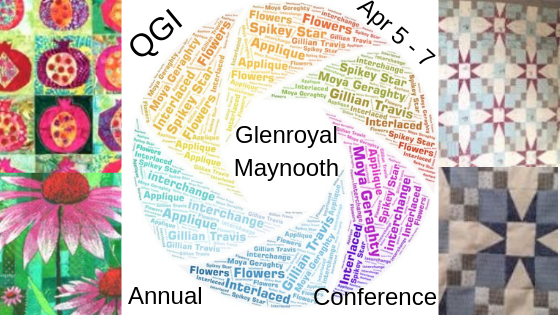 QGI Members, if you have anything that you would like to share on your website, let us know. [Always being cognisant of copyright, of course]. Email theqgi@gmail.com.